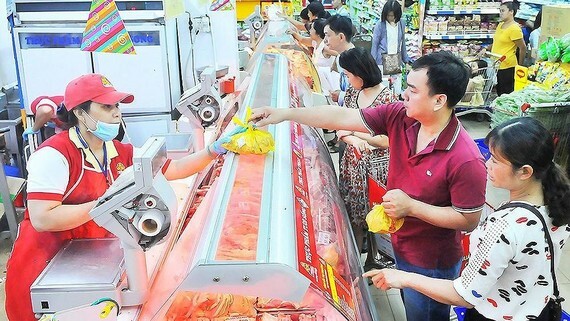 The Government is totally capable of controlling inflation at 3.3-3.9 percent this year with close collaboration of ministries and industries, said Deputy Prime Minister Vuong Dinh Hue yesterday. Ministries and industries must calculate and adjust prices of commodities, healthcare services and education in accord with market signals and should be explicit and timely provide information for the society, he ordered. Deputy PM Vuong Dinh Hue, head of the National Steering Committee on Price Management, chaired a meeting to assess the results of price management in the first quarter of this year on March 28. Consumer price index (CPI) of the first quarter of this year fluctuated in accordance with the rule when slightly edging up in January with an increase of 0.1 percent over the previous month, then strongly rising in February with 0.8 percent and finally declining in March with an estimated drop of 0.21 percent. Average CPI in the first three months of this year is estimated to be 2.63 percent higher than that in the same period last year, the lowest level in the past three years. Core inflation slid 0.06 percent over the previous month in March. An increase of 1.84 percent compared to the same period last year in average core inflation of the first quarter was considered low. Report by the committee said that a hike of 8.36 percent, or VND144 per kWh, in electricity prices merely affected 0.33 percent of CPI rise in March. The Government instructed the Ministry of Industry and Trade to integrate the adjustment of coal prices and calculation of gas prices used for thermo-electricity in accord with the market, as well as ensure transparency and publicity in calculation of power prices so as to avoid the situation that power and coal prices increase in tandem, causing difficulties for generation and trading of electricity and pressure on power price adjustment. The Deputy PM emphasized that price management should be carried out not only based on the law of supply and demand but also based on reality. Price fluctuations should be timely reported to the Government and the Prime Minister for them to draw out solutions in organizing production and consumption. As for CPI control for the rest three quarters of this year, deputy PM ordered the General Statistics Office of Vietnam under the Ministry of Planning and Investment, the Ministry of Finance and the State Bank of Vietnam to predict different scenarios about CPI growth rate of each quarter and the whole year. Of which, the scenario of highest growth in CPI must ensure the target of the National Assembly of about 4 percent. 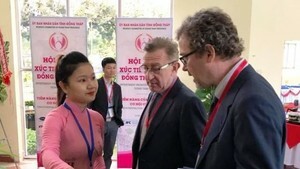 Moreover, Mr. Hue also ordered ministries and industries to pay attention to the declining pork prices and carry out necessary measures to ensure pork supply. As for fuel price management, the ministries of Finance and Industry and Trade allowed disbursement of the fuel price stabilization fund to make up for rising momentum of fuel prices. In the latest fuel price adjustment on March 18, fuel outlets were allowed to tap VND2,801 per liter for E5 RON92 biofuel, VND2,061 per liter for RON95 gasoline and VND1,343 per liter for diesel oil from the fund in order to keep fuel prices stable, providing space for an increase in electricity prices two days later, lessening impacts of power hike on CPI. According to deputy minister Do Thang Hai of the Ministry of Industry and Trade, the Nghi Son oil refinery, which provides 70-75 percent of domestic fuel supply and holds 39 percent of fuel market share, faced a technical issue in power generation so it had to temporarily stop production. The ministry had a meeting with fuel wholesalers and ordered Binh Son oil refinery to increase its capacity and Nghi Son oil refinery to resume production soon. In addition, it also instructed market surveillance authorities to inspect every gas station and ordered fuel distributors to provide enough gasoline for all provinces in the country. On March 22, Nghi Son oil refinery resumed operation but only managed to produce diesel oil. By March 26, it was able to produce qualified gasoline and production of RON95 and RON92 gasoline was expected to be back to normal as of March 28 or 29. The ministry asked Petrolimex to import gasoline with import tariff 10 percent higher than usual to ensure supply of fuel on the market. The Deputy PM instructed the Ministry of Industry and Trade to cooperate with the Ministry of Finance to closely watch the movements of global fuel prices to adopt solutions to adjust domestic fuel prices as well as reasonably set up and use the fuel price stabilization fund to keep domestic fuel prices steady when global fuel prices make unusual changes so as not to affect expectation about inflation.